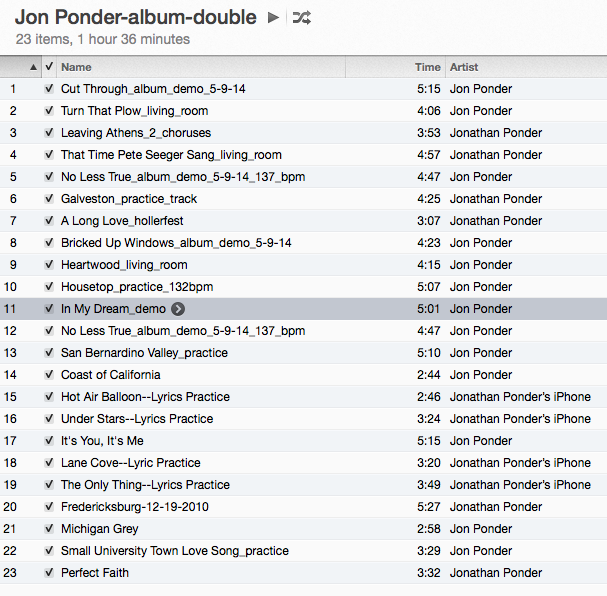 Jon Ponder: Upcoming Album Planning and Prepping! Upcoming Album Planning and Prepping! I'm excited to be planning, prepping, and practicing up to record a full-length album! I haven't decided yet on how and where to record, but I'm looking into options and working on song selection and arrangement and what I want this album to be. I have a surplus of songs I want to put out, so that's a nice problem, kind of. I'm already starting to think of what the next next album might be but also trying to keep my focus on the task at hand. This screenshot from itunes shows one of my working spaces where I'm listening to rough recordings of songs and thinking about album and song arrangement. One particular day I was feeling extra ambitious and started thinking of a double album, but I think I'll whittle it down to one album to start. Anyway, stay tuned for a full-length album in the near future!